Power electronics is the most classified field in electronics where the switching process in power supplies, power converters, inverters, and motor drivers are carried out. A wide application of different electronic components like Diodes, Transistors, MOSFETâ€™s, Thyristors, SCR, GTO, and many more are used. CircuitsToday has provided a lot of valuable contents to get a better idea on the basics of power electronics. But, for engineering students, and other who take this subject for higher studies, it is always better to have a book to guide you through the basics. So, we have compiled a list of 3 books that are very good for students and for references by teachers. These books have been reviewed in detail with their ups and downs. You can also buy these books by clicking on the links provided. For an engineering student, power electronics is considered to be one of the toughest subjects in engineering. Understanding this, the book has been presented in the most simple, yet systematic manner, covering all the topics, and with a lot of examples. The book contains all the relevant contents needed for an engineering student and is neatly presented with simple derivations and graphs wherever necessary. This book is highly recommended for students studying electronics, communication engineering, electrical engineering, and instrumentation engineering. The book is very useful for studying theory and all the explanations are compact and concise. There are 16 chapters in the book, along with 397 multiple choice questions, 501 review questions, 104 unsolved questions, and 194 solved questions. The book is written by Dr. M. D Singh and Dr. Khachandani. Dr. M. D Singh is the former principal of Laxmi Narayan College of Technology, Bhopal. He has been active in the research and teaching profession in the field of Power Electronics for more than 40 years. Dr. Khachandani is a professor in the Electronics and Telecommunications Dept. at SSGM College of Engineering in Shegaon. He too has research and teaching experiences in power electronics for more than 20 years. This book gives a good understanding of all the basics in power electronics. The book is more application oriented and provides a variety of practical and emerging power electronic converters made feasible by the new generation of power semiconductor devices. 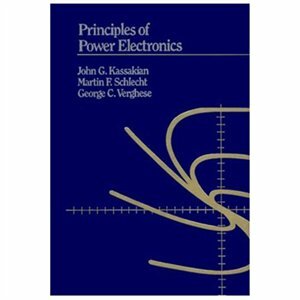 The book also has chapters on different power electronics computer simulation techniques like PSpice, MATLAB, and EMTP. All these packages are explained with simple solved problems and examples. Chapters on diode rectifiers and thyristor converters are also very well explained with neat diagrams. You also get a CD-ROM free with this book. The CD-ROM contains a lot of simple as well as complicated problems for better learning. It also has different presentations on various chapters of the book. Ned Mohan completed his B.Tech from IIT, Kharagpur, India in 1967, and later completed his PhD in electrical engineering from University of Wisconsin, USA in 1973. He has written and successfully published a lot of books in electrical energy systems. Tore M. Undeland completed his PhD degree in Power Electronics from the Norwegian Institute of Technology in 1977. He later took up a job in developing drives for industry robots in co-operation with Kjeld Thorborg.He also spent one sabbatical year at Siemens in Trondheim and Erlangen, and he has been visiting scholar and professor at the University of Minnesota. In 2000 he was made a Fellow of IEEE for his research and education, including publishing an internationally used textbook. William P. Robbins completed his Ph.D in the University of Washington, Seattle, USA. His areas of expertise include energy harvesting, surface acoustic wave devices, applications of magnetostrictive and piezoelectric materials, and curriculum development in power electronics. 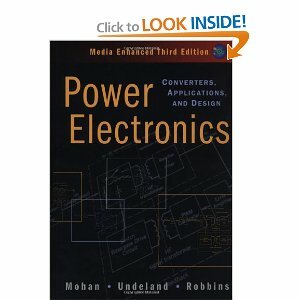 This book goes in-depth for all the topics and brings out the basic concepts, techniques, methods and circuits necessary to learn power electronics. The applications are diverse enough to expose students to numerous types of systems. The authors have brought in innovative ways to derive equations and solve problems for unique questions. John Kassakian is a professor at MIT in Electrical Engineering and Computer Science. He has researched and published papers in Analysis, Design, and Control of Cellular Power Converter Architecture, Electrical System Transient Investigation, Exploration of Non-Conventional Electricity Sources for Motor Vehicles, and Electro-Mechanical Valve Drive (EMVD). Martin F. Schlecht started his career as professor of electrical engineering at the Massachusetts Institute of Technology, where he specialized in power electronics and modular DC-DC converters. For more than 15 years, his research focused on next generation product technology. In addition to his teaching and research, Dr. Schlecht has served as a consultant to the power electronics industry and has published numerous presentations and international books. George C. Verghese completed his BTech from IIT, Madras in 1974, his MS from the State University of New York, Stony Brook in 1975, and his PhD from Stanford University in 1979, all in Electrical Engineering. After his PhD, he has been with the Massachusetts Institute of Technology, where he is the Henry Ellis Warren (1894) Professor, and Professor of Electrical and Biomedical Engineering, in the Department of Electrical Engineering and Computer Science. He was named a MacVicar Faculty Fellow at MIT for the period 2011-2021, for outstanding contributions to undergraduate education.